Notes: Based on the manga of the same name by Yuki Suetsugu, serialised in the josei magazine Be Love. Suetsugu was previously infamous for committing plagiarism during the 2000-2004 run of the manga Flower of Eden, which was subsequently cancelled (as well as another concurrent manga, Silver), putting her career on hiatus for three years. 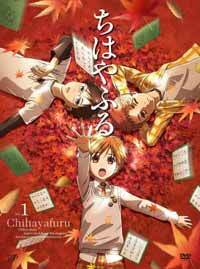 Chihayafuru marked not only a full and triumphant return to the manga industry, but was crowned the winner of the 2009 Manga Taisho award out of a field of ten contestants, including Space Brothers and Yotsuba&!. Redemption indeed! The name of the series comes from a specific poem of the anthology Ogura Hyakunin Isshu (One Hundred Poems by One Hundred Poets), commissioned by Fujiwara no Teika around the year 1200. Translation: Impassionate gods have never seen the red that is the Tatsuta River. Beautiful but hopelessly singleminded Chihaya Ayase is obsessed with karuta - a competitive game in which players must memorize the positions and cards which contain lines from a famous Japanese poem anthology. As a child, she had two close friends to play with ... but now she faces an uphill battle to stay competitive, or even find anyone to play with! Among her classmates, karuta is seen as an old-fashioned and obscure hobby, but Chihaya is determined to become the best karuta player in Japan, and she enlists several classmates (by whatever means necessary) to form a competitive karuta club for her high school. Apart from having studied a handful of the Hyakunin Isshu poems in college, I essentially came into this with no working knowledge of the game of karuta or its competitive culture. In fact, when I started watching this show, completely on a whim (and a strong recommendation from Mippa), I was in a two-year anime hiatus. I figured, hey, this could be something like Hikaru no Go but for an older market, and I figured it'd be a nice way to pass the time, instead of trying to slog through moe rom-com series #241. It turns out Chihayafuru is the show that would bring me back fully into anime. Simply put, this is a great show with fantastic characters, and it's the perfect antidote for folks who need a break from the breakneck pace of explosions and fan service that has flooded anime since time immemorial. Shows like Chihayafuru are what make anime worth watching. What I appreciate about this show is that it very pointedly isn't like most titles out there today - its leisurely pace and emphasis on storyline gives plenty of time for each of the characters to develop into genuinely interesting and unique personalities. We get to see what is essentially the main trio (Chihaya and her two childhood friends Arata and Taichi) in an extended flashback that effectively sets up the remainder of the series' drama, though the romantic overtones that come in later never overwhelm Chihaya's desire to better her karuta club and her own skills as a player. What's important to note is that, while karuta is clearly a unifying theme and there is some analysis of gameplay and strategy here and there, the emphasis of this show is clearly on its characters. Pleasantly quirky and occasionally stubborn, Chihaya (Asami Seto - Yoshino Takatsuki in Wandering Son and Lan in Lagrange - The Flower of Rinne) is one of my favorite characters of 2011 because she's so utterly and unapologetically nerdy. (Though, of course, given that this is anime, she's also drop-dead gorgeous.) She is also guileless, naive, and idealistic, but never ever cloying. Unlike many other sports-type shows, the other characters are fully realized, rather than being props to emphasize varying aspects of the game. I'll leave the viewer to explore this facet themselves, as describing each character would take up a fair bit more space than I will allow myself here (though I will give a particular shout-out to kimono-shop girl / junior poetry scholar Kanade Oe), but it's safe to say that the supporting cast comes up quite big here. While there isn't really any "action" to speak of (the closest we get are cherry blossom petals and autumn leaves), the animators do a great job setting the mood of each episode, while emphasizing the emotional and intellectual intensity that frames competitive karuta matches. I had no idea that competitive karuta was televised, but that shouldn't surprise too many people given the depth of both sport and poetic tradition in Japan. At times, the characters of Chihayafuru take the time to explain the meaning and feeling behind some of the poems, which are vibrant, beautiful stories in and of themselves, often breathtakingly realized onscreen. It is times like this that remind us of how anime can indeed be high art. If there are any quibbles, it is that this show is often so focused on its subject matter that it's possible to lose audiences when game mechanics and occasional jargon like "pillow words" get thrown about. There's also one recap episode that really doesn't do much to contribute to the overall narrative, though the vignette about Chihaya's sister ends up being as heartwarming as the rest of the series. The big thing is that there is virtually nothing here for fans of action, fan service, or the moe character aesthetic -- it's clearly intended as cultural nostalgia aimed at young Japanese housewives and office ladies, so it's almost something of a happy accident that it ends up appealing to anyone outside that demographic. In an age where shows compete to be the flashiest and fastest, Chihayafuru's simple elegance is easy to overlook and dismiss, but it doesn't take a doctorate in classical Japanese literature to realize a good story when you see one. Recommended Audience: There is very, very little objectionable content here - an ancillary character or two dies of illness, and there might be some mild violence in the form of corporal punishment. One female character is noted in conversation to be well-endowed, but in a subversion of virtually every anime cliche ever, she is always very modestly dressed. Best for young teens and above, but primarily due to the emotional and intellectual level of this show being above the heads of most younger children, rather than anything offensive.